OK, I’ll get this out of the way first. I hate the way the ‘Super Lumina’ logo looks. I get why Naim Audio did this (it’s meant to show superluminal motion in action, itself an abstraction of an abstract concept) but it just looks like someone had a progressively broken space bar when writing that name – ‘S U P E R’. I’m staying distinctly Newtonian here. Many of Naim Audio’s core buyers have an ‘interesting’ relationship with cable. Their loudspeaker cable of choice for the last quarter of a century or so is Naim’s NAC A5; this is the perfect example of a ‘do just one thing well’ design, in that it has excellent ‘musicality’ (a combination of timbral properties alongside – naturally, being Naim – a good sense of musical order and beat), but almost everything else takes a back seat. This sonic signature traditionally dove-tailed nicely with Naim’s equipment, but the limitations in detail resolution, soundstage, and even the tonal balance of the cable began to prove something of an obstacle to ultimate performance, especially in the light of products like Naim’s 500 series and Statement line. Yes, other cable brands are available and many Naim users use other brands (most notably from the Chord Company line), but such is the loyalty to Naim that standard NAC A5 is used in some extremely high-end Naim set-ups. Super Lumina addresses that need to push the cable envelope for Naim’s most loyal followers. In interconnect or speaker cable form, Super Lumina features silver-plated copper conductors and silver-plated tellurium copper alloy connectors and FEP insulation throughout. XLR and DIN connectors for the interconnects use Naim’s unique Air-PLUG connectors. These feature individually machined and anodised aluminium rings. Aluminium’s non-magnetic properties make it consistent with materials used on the chassis of Naim products, and a highly durable connection to boot, but gold terminals are used on its RCA plug versions. 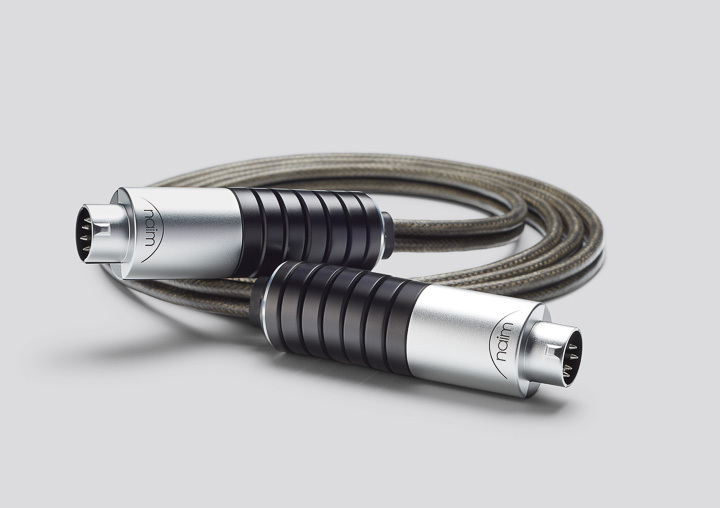 All the shielding on both interconnects and speaker cables uses a non-magnetic tin-plated copper weave, and the cables are finished in a subtle and elegant shade of mid-grey. Super Lumina is also thinner and more flexible than most high-end audio cables. Discretion rules! Like Naim’s other cables (except for sold off the reel NAC A5 ), Super Lumina is made by hand in the company’s Salisbury HQ. It’s also subjected to the same ‘destressing’ process used by Naim for decades (this means cables get hung like game, and periodically shaken like the apocryphal lamb’s tail). Little gunmetal alloy blocks seal the ends of the speaker cables and those ends can be spade lugs or 4mm terminals. Naim’s cables must be used both within and outside of context. It’s pointless discussing them without passing them through the lens of Naim Audio equipment, but at the same time it’s also worth checking out Super Lumina in absolute terms, comparing it in a system with no other Naim products, just to see if its scope extends beyond the Naim ecosystem. In the first case (used in a Naim system), Super Lumina makes a very strong case for itself, and not just at the Statement grade; what it brings to Statement, it also brings to the company’s 500 and even Classic and Uniti lines. And what it brings is speed and leading-edge detail, but without the pinched and pitched presentation that often accompanies those attributes. This makes both interconnect and loudspeaker cables extremely adept at conveying the emotion behind the music. It also brings many of those high-end audiophile properties to the sound without undermining what makes Naim sound like Naim. In other words, use this with a pair of loudspeakers with good imaging properties and the width and depth of the soundstage is more expansive, enveloping and three-dimensional, and the level of detail retrieval and microdynamic shading on offer make a Naim system with Super Lumina considerably more attractive than the standard cable. However, that all being said, Super Lumina is not the richest sounding of cables, and I think that – and the price – make it more of a candidate in the more fuller sound of Classic, 500, and Statement pieces; the combination of Uniti and Super Lumina is exceptionally detailed and focused, but does lack a little body.